Charter Communications is using the benefits of the Republican-promoted tax cut to buy back its own stock, because the only other option under consideration was using the money to buy up other cable operators. 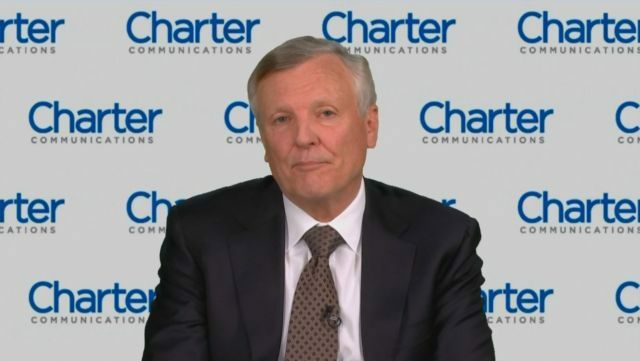 Charter is not using the company’s lower tax rate to benefit Spectrum customers with lower bills or more extravagant upgrades. Instead, it is accelerating efforts to please shareholders and executives with efforts to boost its share price — something key to top executives’ performance bonuses. With digital and broadband upgrades nearly complete in areas formerly served by Time Warner Cable and Bright House Networks — the cable companies Charter acquired in 2016 — Rutledge told investors he can initiate additional upgrades without spending huge sums on infrastructure buildouts. Gigabit speed is now available in most markets, and the company has doubled its lowest internet download speeds in areas where it faces significant competition from AT&T from 100 to 200 Mbps, boosting sales of Spectrum broadband service, according to Rutledge. Today, about 60% of Spectrum customers are offered 100 Mbps, while the other 40% — mostly in AT&T service areas — are getting 200 Mbps. Rutledge told investors he does not see much threat from Verizon FiOS or its newly launched 5G offerings, and has no immediate plans to upgrade service in Verizon service areas because neither offering seems that compelling. Analysts are uncertain whether Rutledge’s comments are naïve or brave. “We see 5G fixed wireless broadband [like that offered by Verizon] as the largest existential threat to broadband providers, by far,” wrote analysts at Cowen. Until now, most broadband competition for cable operators came from phone companies pitching DSL. Verizon retrenched on its FiOS offering several years ago. But AT&T has been more aggressive upgrading urban areas to fiber service, which has forced Charter to respond with higher speeds and better promotions. Rutledge does not see Verizon’s 5G being a significant competitive threat for several years, and suspects Wall Street may once again punish Verizon for spending money on a wireless network less capable than what the cable industry offers today. Shareholders may also dislike watching Verizon distracted by the home broadband market when portable wireless revenues are much more important to the company. Verizon officials claim about half of those signing up for its 5G service plan were not current Verizon customers. But the company would not say whether their new fixed wireless customers were coming largely from cable or DSL disconnects, which would prove marketplace disruption. While I don’t really mind these tax cuts being used for the purpose of buying back shares, which you kind have to as one of these companies, I do wish that I could see the 200 meg upgrade come soon to non competitive markets. I do understand why 40 percent of areas do have it while the other 60 does not (competition) but I wish they would just extend it to everyone. It would not really add any cost to Charter. I do appreciate though all the upgrades Charter has done. As long as upgrades are happening, and service stays great, I have no problem if the company wants to please shareholders more, though not at the expense every time of the customer. Hopefully the next upgrades will involve the upload because that is very much needed. Though that won’t be nearly as straight forward and easy as Docsis 3.1 was. Spectrums service is horrific . Look at all the complaints on their Facebook page. Omg . I think they are giving mega bit speed. Not mega bite speed. Big difference. And they cant pay their workers the contracted health benefits and pension plan . While last year SPECTRUM CEO made 99 million. I think I’ll pass and this “service”. How about investing in some CAPEX. Identify and fix problem areas. O wait Spectrum don’t need to do that. If I had to guess my bottom dollar I would bet they have connection issues and the like in areas where they have no real competitors. Areas with real competitors are maintained and competitive. REGULATE, REGULATE and enforce monopoly rules and/or strengthen monopoly rules. This is the only thing that will fix these type of companies. until competition is real we can’t just think a company is going to do the right thing for it customers. Are you in an area that can even get Spectrum service? Because in areas where they actually have to compete, they’re actually pretty decent now. Yes, they got gigabit significantly later than a lot of Comcast markets, but I’ve had gigabit for a year now and it works fine. No caps or modem charges either. Would I jump at something better? Yes. Was having to fight them for months to get service installed in my new place annoying? Yes. Has the service been reliable since installed? Also yes. Let me say that the CEO of Charter Spectrum should be afraid of Verizon. Verizon’s Fiber cable is way superb than Spectrum Time Warner Cable. I know, I have been a Tech for Time Warner for 25 plus years. When paragon cable started building the plant in NYC and installing fiber, the future looked great. As Time Warner came in and management changed hands the system started falling apart. The company was installing cable converters that didn’t work, Cable modems not working properly because the more customers jumped on Broadband the cable speeds slowed. Then management realized they had to install more fiber nodes to open more bandwidth so the system can handle more customers. As years went Time Warner knew that the system needed a rebuild and upgrading their plant and equipment the feeds the building in NYC metro area. Management didn’t care, they blamed my fellow technicians for repeated service calls. I would see the same customer 5 times in two weeks because Time Warner Spectrum management kept sending out refurbished cheap cable modems and routers. Equipment that didn’t work with the systems, management was looking to save money and didn’t listen to their technicians. Our Union told management in the higher up’s that customers are not happy with the equipment that is being installed in the homes, customers deserve better. No one cared in Management, CEO’S come and go looking to collect a big paycheck. I tell customers to get Verizon because you don’t have to worry about cable leakage,you get better picture, better internet, no worries about digital break up. Even Spectrum cable uses Verizon for their cell phone network and business solutions.